If I’m being completely honest, I feel a little hypocritical writing this post because desserts are the thing I struggle with the most. When I started transitioning over to a mostly whole foods diet, I did it in stages rather than a total overhaul because I didn’t want to scare myself away. When I rejoined Weight Watchers in December 2010, there were still two main areas I struggled with in terms of eating processed foods – bread and dessert. Those 100 calorie sandwich thins, bagels thins, and flatout wraps were just so good and I felt like I was getting a lot more bang for my buck than with regular bread. It wasn’t until WW launched the new plan and these things tripled in points value that I started to look for alternatives. 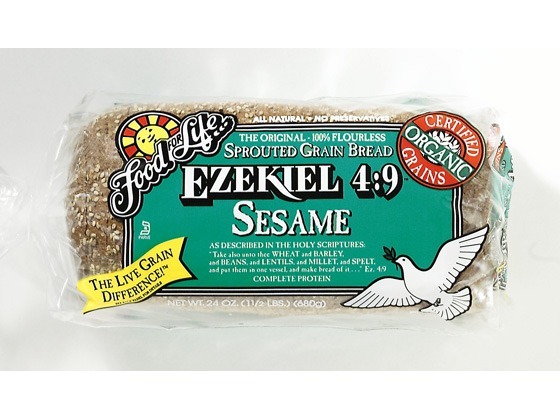 After hearing a lot about it, I tried Ezekiel 4:9 Sprouted Sesame Bread for myself and it changed things for me. Yes, it’s 2 pts+ a slice instead of 1, but it is sooooo much more satisfying than the airy light bread. And I also learned to embrace open faced sandwiches, which helped a lot too in terms of staying on points during the day. Since then, I’ve also introduced whole wheat pitas and English muffins into the mix, and those three things make up most of my regular bread intake. So bread down, onto the next. Here’s the thing. Weight Watchers brand Ice Cream Candy Bars taste so good. They taste like the ice cream snickers bars from my youth and just melt in my mouth for 4 delicious PointsPlus. Same story with sugar-free italian ices that are just 2 pts+ when the sugar-laden counterparts are double the points (granted neither version is very good for you). I may or may not have recently finished a box of both of those things. Mostly may. The problem comes when you make yourself look at the ingredient list, which I am really good at not doing when it comes to desserts. In my beloved oh-so-delicious weight watchers ice cream bars, here’s the list of what is in each and every bar. So all of this is a very long-winded way in saying that I’m really trying to make the switch to eating more whole foods desserts and I’m definitely not the most qualified person to help in this area since I struggle myself. I came up with a list of ideas and have started implementing some of them, but would love if it you guys could chime in with more ideas on some good treats to eat, made from things I know how to say! Banana Softserve – Take frozen bananas and place in a food processor until combined. Turns into creamy deliciousness and you won’t even believe there’s only banana in there! Top with chocolate chips and crushed walnuts. banana pops – take 1 banana and slice in half lengthwise. 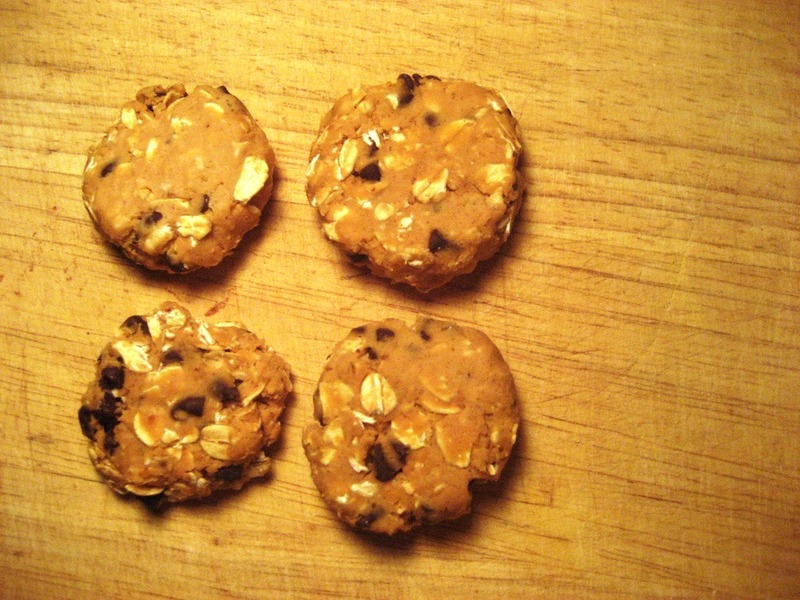 Place popsticle stick in each half, drizzle each with 2 tsp chocolate chips and 1 tsp almond butter, melted. Optional: roll in coconut or nut of choice. dates stuff with almond butter – take 3 dates, remove the seeds, and put 1 tsp of almond butter in each one. Close back up, wrap in plastic wrap, and freeze. 1 pt+ each! Frozen Smoothie – 1 cup milk of choice with banana, frozen fruit of choice (no sugar added), and dash vanilla extract. Placed in freezer for 1+ hour. Cinnamon Dunkers – Ezekiel 4:9 bread toasted, sliced into strips and sprinkled with cinnamon. Dip in unsweetened apple sauce. Maple Yogurt Dip – 1/2 cup nonfat greek yogurt mixed with 1 tbsp maple syrup, with apple slices for dipping. Bananaleche (c/o my sister Wendy) – Mix 1/2 cup nonfat greek yogurt with 1 tbsp brown sugar, and then stir in a sliced or mashed banana. Do you have a sweet tooth? What are your go-to desserts? Also, are there any areas in your diet you struggle with more than others? I use the term diet to mean what you eat, not a strict plan you’re following! Your blog has really inspired me to get back on the WW wagon. I am joining tomorrow! Thank you. For frozen bananas – I always peel them first! I usually cut them in half and then throw them into a ziplock and throw them straight into the freezer. I eat them straight out of the freezer sometimes because they don’t get hard hard like other frozen fruit. They are SO good! And it’s an awesome way to save bananas from going bad if they’re on the verge. I do have a sweet tooth — I usually try to calm it down with fruit and that helps! A “baked” apple with tons of cinnamon is my treat most nights — that or a fruit smoothie (fruit + almond milk blended with ice). I love dates with nut butter but I’ve never frozen them before — sounds delicious! They are SO good frozen! Dates and I have kind of an iffy relationship though – I tend to go overboard when they’re in the house, but WW does count the fresh ones (which kind of feel like dried) as 0 pts+, so it could be worse. i’ve been eating a lot of haagen dazs raspberry and mango sorbet. 3 pts+ for 1/2 cup. ingredient list: Water, Raspberry Puree, Sugar, Corn Syrup, Fruit Pectin, Lemon Juice Concentrate. probably haha. my boyfriend couldn’t believe there wasn’t anything except bananas in it because it’s so creamy! I am the EXACT same way. I’m on it all day but when dessert comes around, I’d still eat processed crap. THANK YOU for this post!!! you’re welcome! it is hard to overhaul it all at once though, so one step at a time! I am definitely a big dessert person, but I fluctuate between going cold turkey and overdoing desserts BIG TIME. It’s hard for me to balance healthy desserts. My go-to’s are mostly processed WW ice cream (those snickers bars are delicious) and skinny cow ice cream cups/ sandwiches. One other thing I’ve tried are “fried” plantains with vanilla ice cream. Basically, you slice a banana in half, and throw it on a pam coated skillet. Then I top it with a sprinkle of splenda (or truvia/ sugar) and let it carmelize. Then I top the banana with ice cream and some chocolate chips (if I have any). So good! You’re the first person I’ve heard of that doesn’t LOVE banana soft serve!! crazy. i can’t get over how delicious it is, but i guess to each their own! the WW ice cream bars are just soooooooooo good. it’s hard. WOW, love the desert ideas!!! I’m still making the switch over to a more whole foods diet, and loving the journey. yeah it’s kind of fun actually! i felt extremely accomplished when I tackled breads, that’s for sure! I just came across your blog & am in love! Definitely my favorite! You’ll love the Eziekel Cinnamon Raisin bread too! LOVE the banana soft serve – can’t wait to try the no bake cookies! Thank you!! =) I’ve actually new tried the cinnamon raisin version!! I keep eyeing it but haven’t picked it up yet. Glad to hear you love it! I have such a sweet tooth after lunch and dinner!! My favorite desserts are banana soft serve with peanut flour, raspberry + chocolate protein powder smoothies, and adora disks… since you can only have two a day they keep me in check! I find the banana soft serve has a bit of an aftertaste, though the texture is perfect. I tried it once with a handful of fresh cherries thrown in and that was delicious. In the absence of fresh cherries, I would try it again with frozen strawberries. Ohhh I love the idea of adding cherries! Sweets are pretty much my kryptonite. I can’t resist them at all. My go to dessert is cookies (or lately, just cookie dough). I try to just have a little bit, or just one or two cookies, but sometimes I go overboard. I have such a sweet tooth! (Though I’ve actually found that when I eat more protein its not quite so raging.) My favorite dessers are: 1/2 cup frozen wild blueberries (I like the Wyman brand best, the whole foods brand tastes seedy/grain-y for some reason) covered with a dash of sweetened vanilla almond milk. (I only use the sweetenened almond milk for this since it has way too much sugar to drink/use normally, but this is dessert right?) It is so good! The milk freezes and the whole dish is higly reminiscent of a granita. I love it! My less whole-foods dessert of choice of late: protein cakes (I found the recipe on foods of apirl), made with protein powder, applesauce, a flax egg, cocoa, and baking powder. Its good plain (and super filling!) but even better topped with coconut butter, cashew butter or peanut butter! Oh! One more: In the summer: grilled stone fruit with a little cinnamon and/or honey. Delicious! Thanks for all the great dessert ideas, especially the cinnamony Ezekial bread. Can’t wait to try that one! I admit that I don’t pay much attention to ingredients in my desserts either. I try to reason that I eat whole foods most of the rest of the time and that bit won’t affect me too much. I love having some dark chocolate as a dessert too, which isn’t too freaky with ingredients thank goodness. Oh yes – dark chocolate should definitely have been on my list! Yum! This is a great post. What about making your own popsicles? You can make them with yogurt, or fruit based. I bought some popsicle molds a couple of years from Ikea but have yet to use them. I took them out of the back of the cabinet this weekend and I’m going to make an effort to make something. I have this idea of a melon/mint popsicle floating around in my head. I was thinking of blending just the melon, mint, and lime until liquified then pour into popsicles and freeze. I guess you could use some honey if it’s not sweet enough. Just an idea. Ohh that sounds delish! Like a fruit salad with mint in it! And awesome idea about making my own popsicles. Love that! -I only eat baked goods that I make myself. Free cookies at meetings are usually gross. And I keep said baked goods in the freezer so that they last longer. -I avoid getting sugar from “hidden” sources like cereal, granola bars, and other processed foods. Advice: check all breads and yogurts for excessive added sugar. I was shocked when I did. -Cutting back on grains seems to have controlled my sugar cravings a bit. I actually don’t remember the last time I ate pasta, I think it’s been 6+ months. Also, a great dessert is fat free plain greek yogurt mixed with peanut flour. It’s like peanut butter mousse. Oooh greek yogurt and peanut flour sounds like a delish combination! Desserts/chocolate treats are a hard one for me too. I buy these bite size 1pt+ swiss chocolates from Costco and most nights I have 1 of those but otherwise I turn to my clean eating books. It may still have some sugars but it’s more whole and I love the little blueberry crumble dessert you make in a ramekin. Healthy and tasty! Sweets are my #1 trigger food. I don’t keep much in the house to prevent trigger food eating. But I like to have little treats available that are lower in calories. I save enough calories to have some sort of dessert–without going nuts. Recently Michael and I decided to try and eat less bread. We no longer buy loaves of bread (I miss it a little, but not enough to crave it). I feel a lot better eating less bread! It looks like we all have a soft spot for Dessert. I would say CEREAL is a close 2nd for me. I wish I could eat bananas but I’m allergic! Can you believe that! I’ve been transitioning to mostly whole food over the past year. The thing is when you eat mostly whole foods, you gradually start to have a lower tolerance for very sweet things. I’ve noticed that. I had dinner with a friend over the weekend and she made a homemade chocolate cake and I couldn’t even eat the whole slice. Portion control made easy. I love my sweets, those are some great ideas! you make eating dessert look healthy! What a great list, and it is filled with things I have never tried before! I love bananas soft-serve with 1/4 cup of almond milk, shaking of cinnamon, and a 1/4 tsp of vanilla. AMAZING! I struggle with my sweet tooth most and go back and forth on whether or not to have certain things, like chocolate in the house. Ironically though, coconut (unsweetened and raw) has become my craving fix – I just have to be careful about portions! I love, love, love dates with nut butter! I never knew how good those were. I have found that I just eat dessert less often, but when I do eat it – I make it the good stuff. I used to try to make fake substitutes and then would eat 600 calories of that trying to satisfy a craving when I could have eaten a 300 calorie ‘real thing’ and been happy. I tend to struggle with snacking or nibbling on things as I pass the pantry. Working at home makes it a little hard to keep that under control. I never really liked desserts when I was younger – but now – well I seem to have quite the sweet tooth. I tend to head towards the dark choccie when I need a sweet fix! I’ve been on WW since September. I did really well from Sept to December, and have struggled since the progam change in December. One of my problems is dessert. I love the idea of the banana soft serve and the nut butter stuffed dates. I’ll have to try those. I like taking a cup of frozen raspberries, and a serving of chocolate protein powder and blending them. Or a frozen banana, the chocolate protein powder and a serve of PB and blending them. I have either of these right after my evening workout. I also liked a baked apple, sprinkled with cinnamon. I need to try those no bake cookies! Surprisingly, my struggle is not with sweets but with salty snacks. I used to buy the low cal options thinking I was being healthy…until I looked at the ingredient list! Thanks for this post. I am also currently trying to tackle my processed food sweet tooth. I will be trying a few dessert ideas with the frozen bananas! Something that I just made today were “chocolate truffles’ from the Whole Life Nutrition Cookbook. These truffles are walnuts, medjool dates, and cocoa powder combined in a food processor then rolled in coconut. They are delicious vegan, gluten free, and all whole ingredients! When I did WW, I never got in to the 100 calorie packs or the WW desserts. I’d occasionally try them in a meeting, but didn’t really like them. So, that wasn’t a problem. I guess my go-to dessert was TJ’s Cat’s Cookies. I also love snacking on dark chocolate (1/4 of a bar at a time). I still have desserts (I love baked goods), but not daily, maybe twice a week. I’m getting in on this conversation a little after the fact, but just wanted to share my current nightly obsession. I take 15 grams (yes I weigh them on my food scale! haha) of dark chocolate chips and melt them in the microwave. Then I cut up strawberries (or apple or banana slices, but usually try to stick to berries) and dip them in. It totally takes care of my sweet fix after a yummy dinner because it totally feels like splurge, but also feels somewhat healthy and more whole food-ish than the packaged desserts I used to rely on! Just found your blog and I’m so happy! I’ve joined WW again for the millionth time and I like the new program because of the fact it encourages more REAL food. One treat I love the Emerald Cocoa Almonds. They’re expensive so I only buy them when I have a coupon. I recently found a recipe and I’m excited to try it this weekend. As for now, I’m off to Trader Joe’s to pick up a few things that I saw off of your Staples list. I’ve been reading your blog for a few weeks now. I won a ticket to Fit Bloggin and I’m excited to meet you. I love this post! It has given me great ideas. I have a question about dates. I don’t think you can buy fresh dates this time of year. I’ve been doing some research because I asked at Whole Foods for fresh dates and they gave me the ones that are cold in the produce section, but my husband thought they were dried (sun dried like raisins). I started reading about fresh dates and they look different and are only available a couple of months a year. I’m really confused though, because if the Whole Foods ones are dried, then why do you keep them cold? At 5pt a 1/4c, I just want to make sure of what I am eating. I want them to stay zero pts. I love doing chocolate dipped fruit. I’ll melt dark chocolate and dip different fruits: oranges, bananas, strawberries, dried apricots. Trader Joe’s has 100 calorie bars of dark chocolate which are perfect portion control! I do love Vitatops which are a little more processed. i love those chocolate bars from Trader Joe’s!! I just had my last one Saturday night. Sad story! I have a bad sweet tooth habit but I LOVE these. For only 45-50 calories a cookie, I never feel guility eating them! In Korea, they serve fresh fruit for dessert. I know it sounds boring, but they usually find something in season and it’s really refreshing after a Korean meal. Sometimes they serve some form of tea as the dessert. I don’t think it sounds boring – I LOVE fruit. Lately I’ve been loving Frozen Mango in particular, and i’ll let it sit out for a few minutes so it gets to be the right texture and then eat it up. So good! I just joined WW online again and I came across this because I was really dying for dessert and wanted to keep within the “Simply Filling” option of WW. I keep frozen bananas in the freezer for milkshakes. 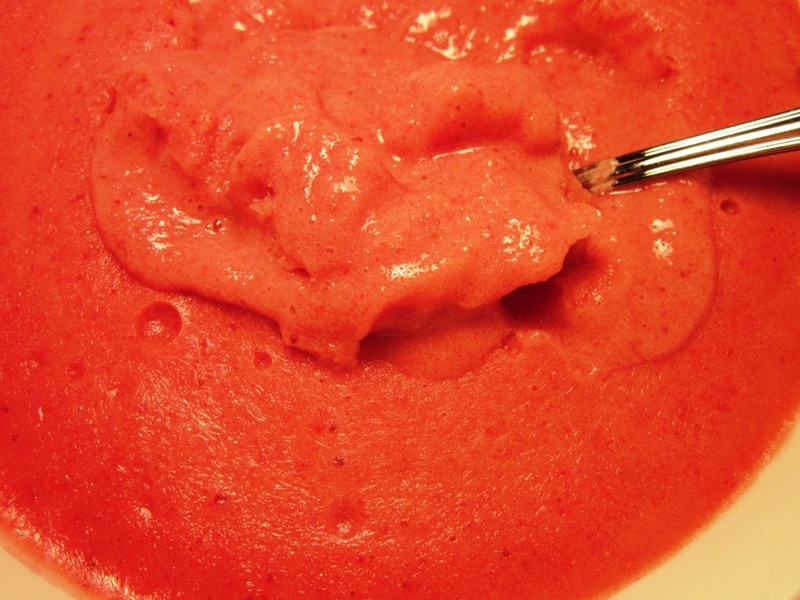 I put two in a food processor and oh my gosh – JUST like soft serve ice cream!! Thanks so much for the tip! I’m doing Weight Watchers, but desserts are my weakness, too – I love to bake & it’s been a challenge to find healthy things to make. I find that a lot of the WW desserts include things like Jello, Cool Whip, cake mixes, & lots of processed foods. I don’t want to eat that stuff just to lose a few pounds. The dates with almond butter are my absolute favorite – I swear it’s like eating a snickers! I also love chopped apples mixed with a couple of tablespoons of nonfat greek yogurt, a splash of maple syrup, cinnamon, some chopped walnuts, and raisins – healthy & really filling. When I bake, I try to substitute some of the butter or oil with applesauce (yields pretty good results in cake, muffins, and some cookies). Good luck with your journey!